If you like some history with your basketball card collection, but you would rather not pay a fortune to own it, we have some assistance. Here's a list of five cheap vintage graded basketball cards to think about when you're pondering your next purchase and why we think they provide good value for the money. The 1971-72 NBA season was when West not only won the NBA title but also led the Lakers to a 33-game win streak. As these achievements become more iconic, collectors may look to acquire West's card from that year. West scored 25.8 points per game, and he also led the NBA in assists with 9.7. He was All-NBA First Team and NBA All-Defensive team, and to show how dominant he was that season he was also the All-Star Game MVP. He's so highly regarded tha man years ago the league made its logo silhouette out of a photo of West dribbling. A true basketball legend, West still isn't expensive if you're talking 1970's material. You can grab a '71-72 West card for around $15-20. Even a graded '8' won't set you back more than $50 or so. Few have had a career as long and as successful as Pat Riley. A first round pick of the San Diego Rockets in the NBA Draft, and also picked by the Dallas Cowboys in the NFL Draft, Riley would eventually make his way to the Lakers where he provided key bench production for the 1972 championship team. A broadcaster and assistant coach for the Lakers, he is famous for coaching the Showtime version of the Lakers in the 1980s. Riley would also coach successful New York and Miami teams. His rookie card is from one of the oversized Topps sets of the 1970s. It provides the space for a large picture of Riley holding the basketball, a big difference to how most of the NBA fans remember him as a coach wearing suits on the Lakers bench. His ungraded cards have been selling on eBay, for around $10 to $20. A graded '8' is around $85-100 but only around 70 exist and far fewer 9's so they're hard to find. 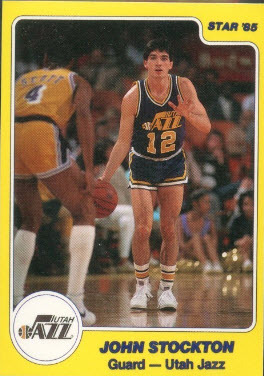 Nine consecutive seasons of leading the NBA in assists per game, the all-time leader in assists, ten all-star games, John Stockton had an amazing career and collectors will need to find a 1984-85 Star Utah Jazz team bag to get his first card pack-fresh to send for grading. His Star card is designated an extended rookie card due to the lower print numbers and less-extensive distribution of the cards. Stockton's more widely accepted rookie card would appear much later, in the 1988-89 Fleer set. On eBay his ungraded Star #235 has sold for around $60. Two graded cards, both BGS 8.5 NM-MT, sold recently for less than $170. "Tiny" had a big career that brought in some unique numbers. The 6-1, 160 pound guard point guard won the Rookie Of The Year award with 16 points per game. 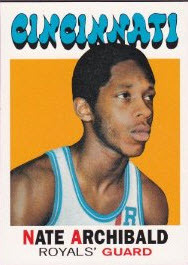 He then went for 28.2 points a game in his second season before his career-year in 1972-73 with 34. His 1972-73 season should be celebrated more than it currently is, as Archibald led the NBA in points per game and assists per game. Archibald will be a player that is needed by collectors if they are searching for cards o f the NBA's 50 Greatest Players. He's an underrated superstar thanks in part to spending much of his career in the Midwest, playing for teams that weren't always championship caliber. He did enough in his playing career to be someone that collectors wanted, especially New York Knicks fans, but when his coaching career is also added it makes Phil Jackson one of the big names of NBA history. His rookie card is affordable, with ungraded examples in higher grade usually selling for $25 or less. High grade examples can be a challenge but those in a '7' holder shouldn't sell for more than $25-35. 1984-85 Star #235 John Stockton Utah Jazz RC Rookie HOF BGS 9!!! 1984-85 STAR 235 John Stockton RC Rookie Card BGS 9 MINT QUAD + GEM 9.5 Surface! 1971-72 TOPPS #29 NATE ARCHIBALD PSA 9 RC ROOKIE HOF - STUNNING CARD! 1971-72 TOPPS # 29 NATE ARCHIBALD RC BLACK PROOF BGS 9.5 SOLO FINEST GRADED . 1972-73 Topps #32 Phil Jackson Rookie Card RC BGS BVG 8 NM-MT Solid Subgrades! Should I Get My Basketball Cards Graded?